In the year 1900, the National Encampment of the Sons of Union Veterans of the Civil War voted to establish Memorial University, a college located in Mason City, Iowa. Its purpose was not only to educate, but also to instill patriotism in its students, and prepare them for an active role in American society. The University was closed in 1910. This web site, Memorial University, is intended to continue this noble cause and to encourage patriotism, good citizenship and provide a basic knowledge of the American Civil War. 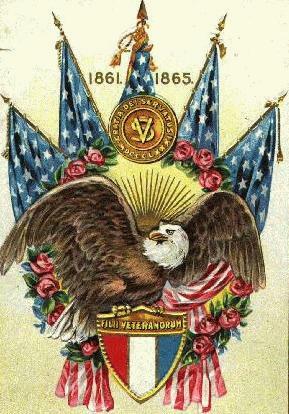 In 2008, an education course for Junior and Junior Associates of the Sons of Union Veterans was developed by the SUVCW National Committee on Americanism and Education and made available through this web site. In 2009, the curriculum of Memorial University was expanded with the development of an Officer Training Course for members of the Sons of Union Veterans of the Civil War. This course was a vision of Commander-in-Chief David V. Medert and was achieved through the efforts of a Special National Committee on Education and Leadership established by the 127th SUVCW National Encampment. Click here to view the Memorial University Graduates !